Alex Pike’s winless streak since returning as Gosport manager stretched to eight matches as his side were condemned to a 5-0 defeat at Banbury United. 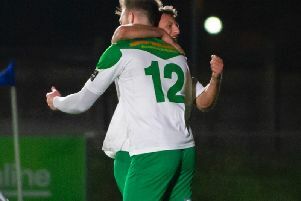 Ricky Johnson netted a hat-trick for the hosts as Borough’s woes at the bottom of the Southern League premier division continued. The first half was a cagey contest but the game finally burst into life on the stroke of half-time. Although Johnson bundled the ball into the back of the net, the referee had already blown up for a foul on Tom Bradbury and awarded the hosts a penalty. Elliot SANDY stepped up to take the spot-kick and slotted his effort beyond Borough goalkeeper Patrick O’Flaherty. The visitors soon found themselves 2-0 down less than a minute into the second half. A corner was swung in by Tom Winter and there was JOHNSON to head home and double the home side’s advantage. Banbury continued to put their foot on the gas and scored a third on 55 minutes when JOHNSON converted Darren Pond’s cross for his second of the afternoon. Things got worse for Pike’s side when Jack SELF slid Winter’s cross home to added a fourth for the hosts. JOHNSON then completed his hat-trick 21 minutes from time with a powerful header from Leon Lobjoit’s cross to inflict further damage on Gosport. The defeat leaves the Privett Park outfit rooted to the bottom of the Southern League premier division.